The year 2015 may go down as the most memorable year in the life of versatile actor Nawazuddin Siddiqui because after BADLAPUR (20, February) and BAJRANGI BHAIJAAN (17, July) Nawazuddin Siddiqui has scored a hat-trick in his latest venture MANJHI THE MOUNTAIN MAN. The movie which released on Friday opened to descent opening with the movie doing good business in circuits such as Mumbai, Pune, Gujarat, Delhi and UP. In fact the movie even overtook Abhishek Bachchan and Rishi Kapoor commercial masala entertainer ALL IS WELL released this week. Thus adding feather into the cap of Nawazuddin Siddiqui as the movie has solely pulled in audience on the strength of Nawazuddin Siddiqui’s histrionics and his recently gained stardom. Both film critics and cine buffs are going gaga over Nawazuddin Siddiqui’s mindboggling performance. What makes his performance adorable is the effortlessness with which Siddiqui plays the character. Siddiqui brings out all the emotions to the fore with his facial expressions and emotes through his eyes. Viewers are left speechless at his flawless acting skills. Further what makes the movie interesting is its inspiring tale of a man breaking the mountain for the love of his wife aided with perfect screenplay that spell bounds the audience to their seat. 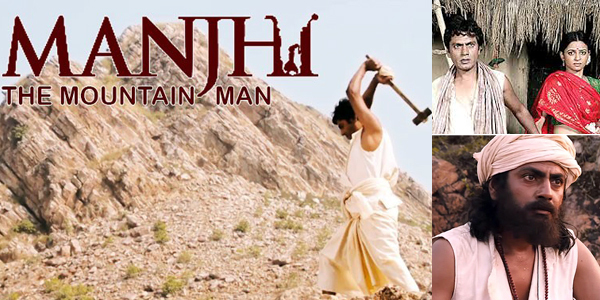 There not a single frame you can separate Siddiqui from Dashrath Manjhi, the original hero who made the English axiom true that – ‘If you have the will, you can move mountains’ by carving a path through a mountain with just a hammer and a chisel after toiling hard for 22 years! Siddiqui’s exceptional performance brings alive the memory of the legendary actor Balraj Sahani, who played his roles with such intensity. Remembers DO BIGHA ZAMEEN, KABULIWALA, WAQT GARAM HAWA etc. Made on a shoe string budget of around 30-40 crores, the movie has collected approximately Rs.10 to 15 crore on its first day at the Box Office and with word of mouth publicity the trade pundits expect the movie to do a successful weekend and end with respectable collection of over Rs 50 Crore business.